The 2-45DTM is a shot blaster that is delivered “turn key” and is very user and environmentally friendly. 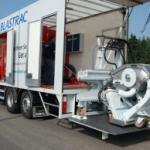 Blastrac is the most experienced manufacturer of equipment for shot blasting roads and runways world wide. Our 2-45DTM is the best possible and most cost effective and efficient solution to regenerate the macro and micro texture of road and runway surfaces. 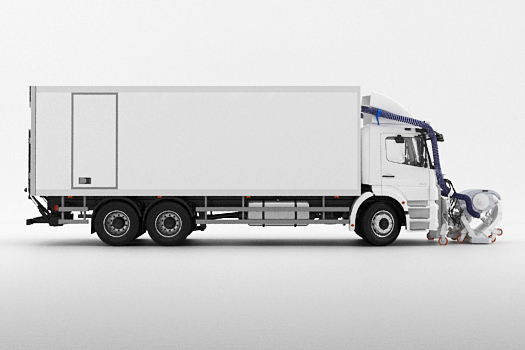 Because of its high performance and reliability it is possible to treat a surface of up to 3000 m2 per hour on roads and runways. Closed circuit which is dust free. Excellent separation system dust / abrasives by improved magnet separation system. Versatile / Heavy duty / High performing machine. Magnetic separator, to perform well on sticky coatings and big quantities of dust. 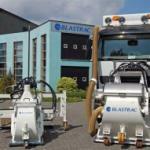 Optimal use on asphalt and concrete, but can also be used on steel. 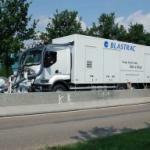 Homogenous blast pattern as well for light as heavy blasting purposes. Can be used for floor preparation / renovation / maintenance and decorative purposes.